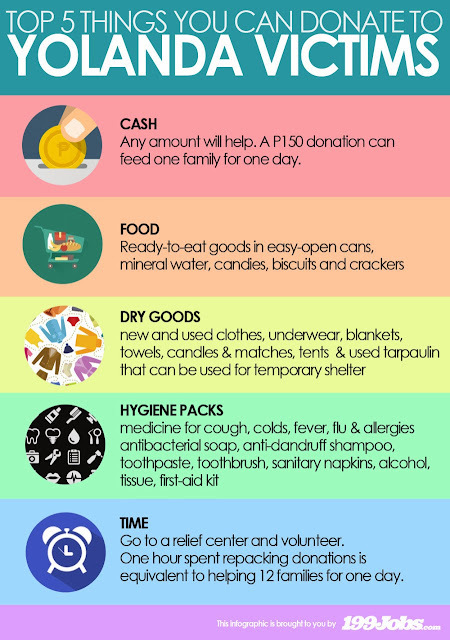 I saw this infographic post about the top 5 things you can donate to super typhoon Yolanda Victims on Jehzlau-Concepts.com. Please scroll down the page to view the whole infographic. Jehzlau said, "If you don’t have money or food to donate, I think we all have time to share." This simple but informative infographic was originally posted on 199jobs.com. You may share this post to your friends or relative so they may know about the 'Top 5 things you can donate to super typhoon Yolanda Victims'. Comments or suggestions about "Top 5 things you can donate to super typhoon Yolanda Victims" is important to us, you may share it by using the comment box below.